Variations in case, for example "new" and "New"
Variations in word forms, for example "walk" and "walking"
Words which add noise, for example stop words such as "the" and "of"
These word clouds illustrate word frequency analysis applied to some raw text data from weather reports, and a preprocessed version of the same text data. Extract the text data from the field event_narrative, and the label data from the field event_type. Create an array of tokenized documents. 8 tokens: Large tree down between Plantersville and Nettleton . 39 tokens: One to two feet of deep standing water developed on a street on the Winthrop University campus after more than an inch of rain fell in less than an hour . One vehicle was stalled in the water . 14 tokens: NWS Columbia relayed a report of trees blown down along Tom Hall St .
14 tokens: Media reported two trees blown down along I-40 in the Old Fort area . 15 tokens: A few tree limbs greater than 6 inches down on HWY 18 in Roseland . 20 tokens: Awning blown off a building on Lamar Avenue . Multiple trees down near the intersection of Winchester and Perkins . 6 tokens: Quarter size hail near Rosemark . 21 tokens: Tin roof ripped off house on Old Memphis Road near Billings Drive . Several large trees down in the area . 10 tokens: Powerlines down at Walnut Grove and Cherry Lane roads . Lemmatize the words using normalizeWords. To improve lemmatization, first add part of speech details to the documents using addPartOfSpeechDetails. 39 tokens: one to two foot of deep standing water develop on a street on the winthrop university campus after more than an inch of rain fall in less than an hour . one vehicle be stall in the water . 14 tokens: nws columbia relay a report of tree blow down along tom hall st .
14 tokens: medium report two tree blow down along i-40 in the old fort area . 15 tokens: a few tree limb great than 6 inch down on hwy 18 in roseland . 20 tokens: awning blow off a building on lamar avenue . multiple tree down near the intersection of winchester and perkins . 21 tokens: tin roof rip off house on old memphis road near billings drive . several large tree down in the area . 10 tokens: powerlines down at walnut grove and cherry lane road . Erase the punctuation from the documents. 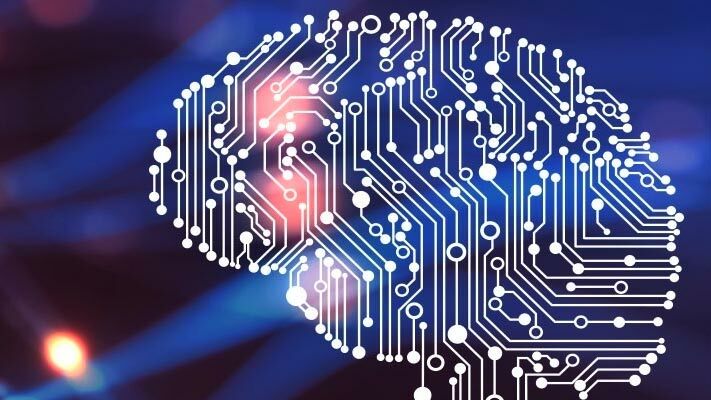 Words like "a", "and", "to", and "the" (known as stop words) can add noise to data. Remove a list of stop words using the removeStopWords function. Remove words with 2 or fewer characters, and words with 15 or greater characters. Remove words that do not appear more than two times in the bag-of-words model. Some preprocessing steps such as removeInfrequentWords leaves empty documents in the bag-of-words model. To ensure that no empty documents remain in the bag-of-words model after preprocessing, use removeEmptyDocuments as the last step. Remove empty documents from the bag-of-words model and the corresponding labels from labels. It can be useful to create a function which performs preprocessing so you can prepare different collections of text data in the same way. For example, you can use a function so that you can preprocess new data using the same steps as the training data. Compare the preprocessed data with the raw data. Calculate the reduction in data. 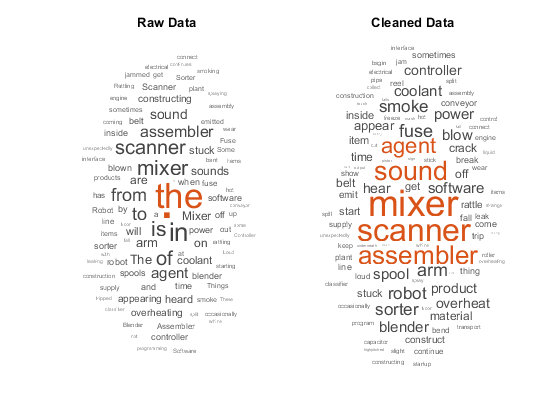 Compare the raw data and the cleaned data by visualizing the two bag-of-words models using word clouds.